This program is a private tuna cutting show just for your group. 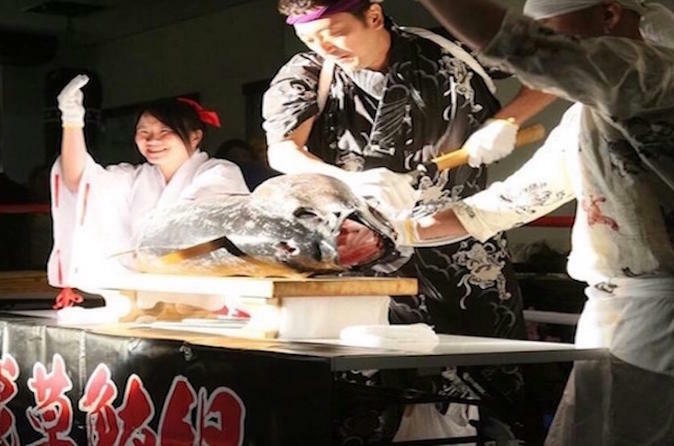 Enjoy watching exclusive show followed by sushi making and eating super fresh tuna in Asakusa! How about seeing the tuna cutting performance and eating super fresh tuna? In this program, a professional chef will perform tuna cutting show privately right in front of you! And you can eat the tuna in sashimi and sushi! It is not just akami and toro. You can get to try other parts of tuna that are usually not seen outside of Japan! This is certainly unforgettable and tasty experience!